1978 Goodchild meats purchased Australind Abattoirs, originally built by the Pike family in 1977. There has been two major upgrades to this facility since purchased by the Goodchild family. This facility is located 25 kilometres north of Bunbury in prime grazing country of the south west of Western Australia. 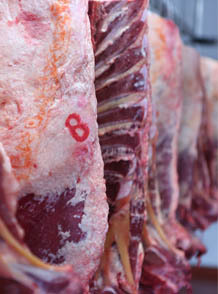 Our abattoirs has a processing capacity of 1000 lambs/sheep and 150 cattle per day on one shift. The facility is surrounded by 50 hectares of land, and our Abattoirs has a stringent safety program which has been developed and implemented. Goodchild Abattoirs holds Halal, Aus-meat, Meat standards Australia (MSA) and cattle care licenses and recently obtained certification for SQF 2000 cm code. Stringent quality assurance programme have been developed and implement across facility. We have a loyal team of 70 workers in delivering our customer a quality product. We are in partnership with Perth hide and skin Company in management of Hides, plus we are linked with Talloman for processing of all our by-products.